(AP) Dustin Pedroia hit a solo home run to pad the Red Sox' lead in the eighth inning. PHILADELPHIA - Manager Terry Francona posted what was surely his most unusual lineup of the season on the clubhouse wall yesterday before the Red Sox played the Philadelphia Phillies. 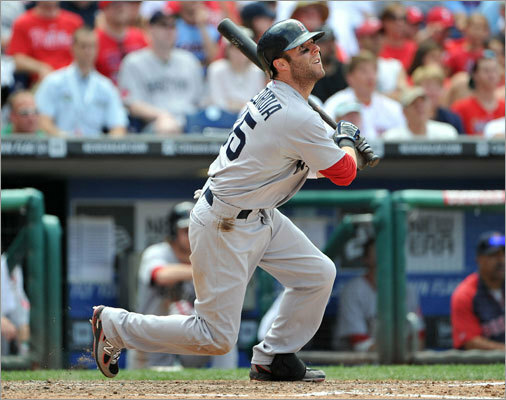 Dustin Pedroia was the cleanup hitter for the fifth time in his career and was followed by Jason Varitek, who last hit fifth in 2007. Darnell McDonald, a .122 hitter, was in the No. 2 spot. Several players looked at the lineup, walked a few steps, and then came back to look at it again to make sure. But the name that mattered most was last on the list. Jon Lester lifted the Sox out of their slump, throwing seven shutout innings in a 5-2 victory. Lester (10-4) allowed two hits, both singles, and struck out five with two walks. With the Sox having lost six of seven, it was a perfect remedy before they traveled to Houston. “We weren’t able to blow this one away, but that was big. It was a really good start by Jonny,’’ said Varitek, who hit two home runs. “You can’t worry about losing streaks, winning streaks, or anything like that. You’ve just got to go out and execute pitches,’’ Lester said. Lester had an effective cutter that he located to both sides of the plate. The Phillies did not advance a runner into scoring position until the seventh inning, when Ryan Howard singled and Shane Victorino drew a walk. But Lester retired Ben Francisco on a fly ball to center and struck out Raul Ibanez with a cutter. Lefthander Cole Hamels shut the Red Sox out for four innings, allowing only two singles. But he was struck on the right hand by a line drive off the bat of Adrian Gonzalez in the fourth, and faced only one more batter. To that point, Hamels had allowed only two runs in his previous 18 innings against the Sox going back to last season. “I wish he hadn’t stuck his hand out there. But we won the game, so I guess it’s important,’’ Gonzalez said. X-rays on Hamels were negative, and he is expected to make his next start. The bad news for the Phillies was exposing their bullpen to the Red Sox’ offense. David Herndon started the fifth inning and swiftly gave up two runs on four hits. Josh Reddick, an offensive force since being called up June 18, had a triple into the corner in right field and scored on a single by Drew Sutton. Singles by Marco Scutaro and Jacoby Ellsbury made it 2-0. Reddick is 11 for 23 with five extra-base hits, five RBIs, and nine runs in nine games since being recalled. Varitek had the first of his home runs in the sixth inning, a drive into the stands in right field. “That’s the ballpark,’’ he said, modestly. Drew Carpenter relieved Herndon in the seventh inning and allowed singles by Sutton and Scutaro before working out of trouble. But Pedroia and Varitek had back-to-back home runs in the eighth. Varitek’s second homer had nothing to do with the ballpark, as it landed deep in the stands in right. Pedroia has home runs in three of the five games in which he has hit cleanup. “Don’t tell me. Tell the manager, man,’’ he said. For Varitek, it was the 11th time he has hit multiple home runs in a game. “It’s a big lift when Tek does that,’’ Lester said. With Lester at 120 pitches, Daniel Bard came on and pitched a perfect eighth inning. He has not allowed a run in his last 12 appearances, a span of 14 innings. Jonathan Papelbon was warming up, but Bobby Jenks was the choice in the ninth inning when the lead grew to 5-0. Papelbon did not get the day off. Jenks allowed a single by Placido Polanco before Howard homered deep to right. The ball had not yet landed in the seats before Jenks was asking for a new ball. When Victorino walked on five pitches, Francona called in Papelbon. The closer got two outs on eight pitches to record his 15th save. Interactive Who should Papi pick?